The quintessential signature color for weddings, there's no denying that this beautiful blush shade is a favorite among brides! And so that's why I was just thrilled to see that a pretty pink had made it onto Pantone's Top 10 color list for Spring, 2016! And this dreamy shade of blush? Introducing, Rose Quartz! So soft, so sweet, so absolutely romantic, this is the kind of color that works effortlessly for Spring and Summer weddings! 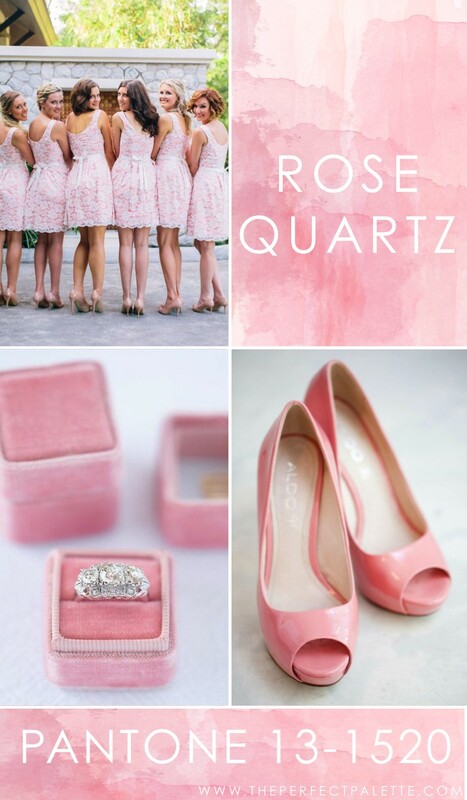 Rose Quartz is the kind of color that exudes a feminine feel. And when it comes to color pairings? Here lately I'm really loving the simplicity of a monochromatic color palette. For instance, why not pair a crisp clean white or a soft shade of ivory? Or even a soft shade of gray? Want to know what makes Rose Quartz feel unique? That would definitely be it's ability to communicate romance in a very effortless way! Want to see more? You can check out our pink weddings here and be sure to swing back by later this week as I will be sharing more of my ideas on how to best incorporate the top 10 colors that made Pantone's Color Report for Spring, 2016. No Comment to " Pantone - Rose Quartz 13-1520 "